Ok, I know I'm biased, but how friggin' cute is my little boy?! Ohh goodness! I just love him!!! What a handsome little guy. I love that look. His clothes just need to be dirty and he needs a few newspapers and he could be part of the Newsies cast. I love the look! What a handsome dude. Cute outfit. How do you get him to keep that hat on? He is so cute! yes dapper is definitely the word to describe that little man! What darling little duds. Oh man I cant believe how big he is getting! And so handsome! It's okay to be biased..especially when they are that friggin' cute!! I'm so glad you commented on my blog =) I look at yours too so I'm glad I'm not the only blog stalker out there. Hehe. 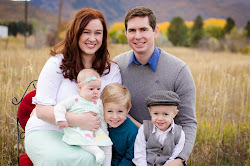 You have such a cute family! ps Love working with your mom. She's the best.